I believe that there are certain stigmas in education that prohibit students from achieving their full potential, no matter what discipline they study. For example, in my 20 years of studying and practicing engineering, I regularly heard people say that engineers can’t spell, write, or communicate well. I bought into this idea, and I really regret it. When discussing education and how technology can impact our students, we talk about engagement as the key to increasing student performance on standardized exams such as PARCC and Smarter Balanced. Recently I was introduced to a piece of research that I believe is the missing link to achieving engagement and providing a deeper student understanding of the common core standard competencies: the Academic Mindsets. According to the Academic Mindsets approach, I just wasn’t trying hard enough to succeed in language arts. I was operating in a “Fixed Mindset,” and cutting myself short on a skill that is necessary in every profession, including mine. 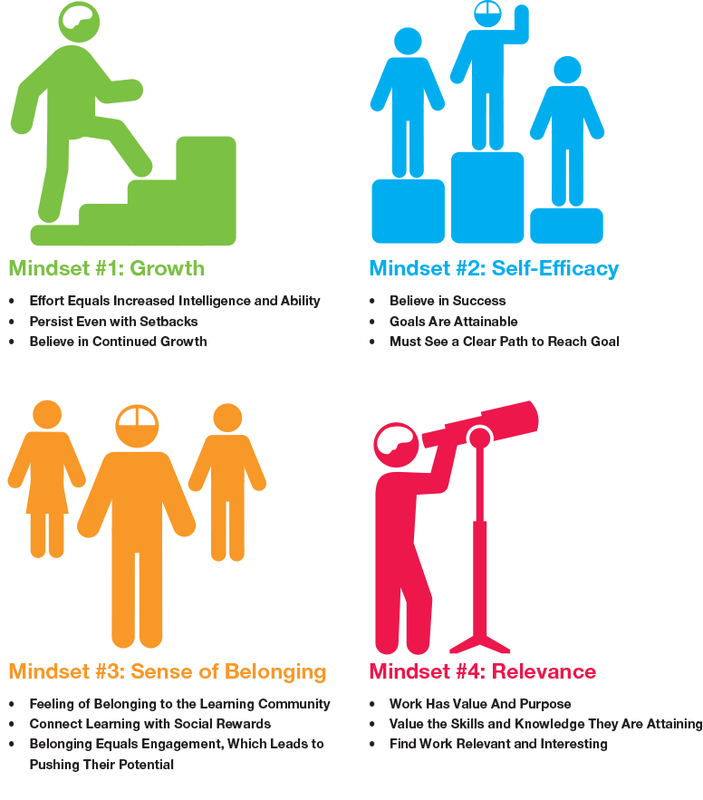 Outlined below are the four academic mindsets, as defined by Stanford University professor Carol Dweck, Ph.D. Of these four, I believe the Growth Mindset has the greatest potential to positively impact our students in the long term, result in stronger standardized test scores, and offer technology in the classroom a new and exciting challenge. 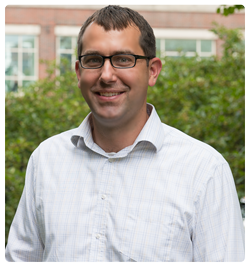 The Growth Mindset is what really resonated with me, as an education technology professional. It is based on the belief that the brain does not have a fixed capacity, but is instead a muscle that can grow with effort, hard work, and dedication. If we in the educational community can incorporate these Mindsets as a fundamental cornerstone of our educational system, we can help students succeed not only in school, but also in every part of their life. Along with using state-of-the-art educational technology to help students learn, we should be teaching them to approach every class and subject area with the same dedication and mindset they would put forth when trying out for an extracurricular activity such as football, the debate club, or the chess club. Learning about the Academic Mindsets caused me to think about some of the subjects I may have missed. I’ve always had an interest in illustration and graphic art, but held the belief that an “innate” ability was required to be artistic and create anything of real use. Because of this mindset, I never put any concerted effort into learning, practicing, or improving my skills in this area – until recently. After taking a handful of online courses and tutorials, and spending hours practicing, I now can create some basic illustrations and successfully navigate the sometimes overwhelming vector graphic programs. I now find myself staring at signs and Web pages, trying to picture the core circles, squares, and shadows that are their graphic building blocks. In short, a little practice has changed my mindset, and I am invigorated by the idea that anything can be learned if you put in enough effort, have the appropriate interest, and believe that you can learn and apply the information. I wish I’d had access to this approach early on in my life and academic career, because I find it a revelation – as well as painfully obvious in hindsight. Who knows what different educational paths I might have explored if I had believed that any subject matter could be mastered? Instead, I focused only on the things that I thought I would be “able” to learn and master, rather than anything that may have piqued my interest. I do believe that the common core standards are good for our educational system, because they promote a deeper understanding of core educational competencies. 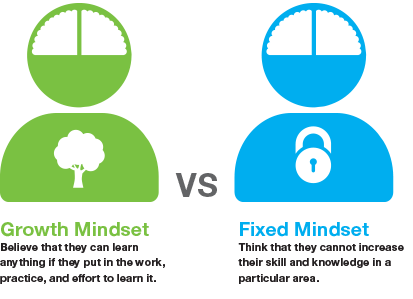 However, they do not address the need to teach our students the fundamentals of learning, like the Academic Mindsets. It is my hope that teachers around the world will make it a point to nurture the Growth Mindset in every student whose life they have the privilege to touch. Here at Mimio we plan to do the same. Without a strong Growth Mindset, would the likes of Einstein, Mozart, da Vinci, and Darwin have advanced society and changed our world in such profound ways? Below are a few tips for igniting the inner Einstein in your students. DO: Make sure students understand that the brain is a muscle that can only grow through hard work and determination (and lots and lots of practice). DO NOT: Tell students they are smart, gifted, or talented, since this implies that they were born with the knowledge, and does not encourage effort and growth. DO: Let children know when they demonstrate a growth mindset, when you observe it. DO: Praise the process. It is effort, hard work, and practice that allow students to achieve their true potential. DO: Embrace failures and missteps. Students sometimes learn the most when they fail. Let them know that mistakes are a big part of the learning process. There is nothing like the feeling of struggling through a very difficult problem, only to finally break through and solve it! The harder the problem, the more satisfying it is to find the solution. DO: Encourage participation and collaborative group learning. Children learn best when they are immersed in a topic and allowed to discuss and advance with their peers. Collaboration is also a very important skill for students to have as they enter college and when they move on to the workforce. DO: Encourage competency-based learning. Get kids excited about subject matter by explaining why it is important and how it will help them in the future. The goal should never be to get the “correct” answer, but to understand the topic at a fundamental, deep level, and want to learn more. Deeper Learning MOOC - A great online MOOC, which heavily promotes the Growth Mindset as well as other concepts of deeper learning. Test your mindset - Mindset quiz. Rubrics for the Growth Mindset in Elementary and High School. Six tips for helping students learn more effectively.